Belfast boxer Carl Frampton goes head-to-head Luke Jackson in a highly-anticipated fight at Windsor Park this weekend. The build-up to the interim WBO featherweight title clash stepped up a gear this as The Jackal made a public appearance in the ring in front of hundreds of fans at CastleCourt shopping centre and yesterday held a press conference ahead of the bout. 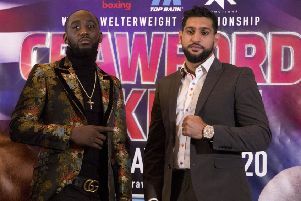 Around 25,000 fans are expected to pack out the National Stadium on Saturday night for what's expected to be one of biggest sporting nights Belfast has ever witnessed. To ensure fans' safety and enjoyment ahead of the big event, Frampton's promoter, Frank Warren, has issued essential information through the Irish FA, including items prohibited from the arena. The list includes team sports shirts as well as certain cameras and portable devices, like iPads and laptops. Everyone entering the stadium should expect to be searched and should allow time for this ahead of arrival at the stadium. - Backpacks, holdalls, luggage, oversized bags and cushions (bags larger than 35cm x 40cm x 19cm will not be permitted). - Team sports shirts, apparel, scarves and insignia of any kind. - Glass, cans, aluminium bottles or thermos flasks of any kind including liquid products which can be consumed. - Any explosives or combustible materials. - Flammable liquids of any kind in any container. - Video cameras and professional cameras (unless accredited media). - Laptop computers, iPads and Go Pros. - Knives or weapons of any kind, or anything that could be used as a weapon. - Illegal drugs or substances. - Signs, banners or flags on poles, staffs or selfie sticks. - Animals (except service animals to aid persons with disabilities). - Air horns, whistles, cowbells, drums or other noise-making distractions. - Projectiles (Frisbees, beach balls, footballs etc). - Aerosol cans (hairspray, deodorant etc). - Fireworks, confetti or glitter bombs or sprays. - Use of wheeled footwear, skateboards, roller skates. - Large studs and chains (studded belts and straps etc). - Anything else which we deem could ruin the enjoyment or viewing experience of others or that may compromise safety and public order.